The Avatar returns to the world searching for excitement, adventure and a good time! New friends, celebrity status, and the ruthless Fire Nation on his tail... can Aang face his destiny to save the world? Chapter 1 The Boy in the Loeberg: Katara and Sokka, a brother and sister from the Southern Water tribe, discover a twelve-year-old boy frozen in an iceberg. Could this be the Avatar the world has been waiting for? 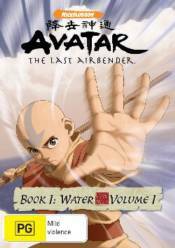 Chapter 2 The Avator Returns: Prince Zuko, a young Firebender whose mission in life is to capture the Avatar, tracks Aang to the Southern Water Tribe village where Katara and Sokka live. Chapter 3 The Southern Air Temple: Aang is eager to take Sokka and Katara to the Air Temple where he was raised, but discovers the temple is not as he remembers it. Chapter 4 The Warriors of Kyoshi: When locals of a small island discover Aang is the Avatar, they treat him like a celebrity, which ultimately leads to trouble!